I admit it. 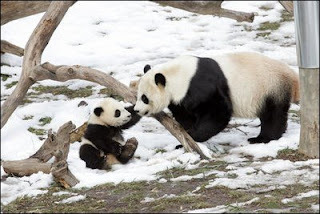 I love bears – panda bears, that is. Let’s face it; bulls are not cute to look at. And the more the Federal Reserve and the government do to feed the bull, the uglier it becomes. Today’s Wall Street Journal features an interview with David Tice, manager of the Prudent Bear Fund. Tice believes the Fed’s financial engineering and dramatic interest rate reductions create “a huge problem for the dollar because foreigners see us continuing to debase our currency. It’s going to be a massive recession if not a depression.” Tice believes that the U.S. economy will fare even worse than Japan’s “lost decade” of the 1990s because “we have depended on foreign creditors” to support our bubble. And now the foreigners are starting to have enough of our ridiculously low interest rates. Today’s Financial Times reports that South Korea’s National Pension Service, the world’s fifth largest pension fund ($220 billion assets), will no longer buy U.S. treasuries because the yields are too low. The fund says it will buy higher yielding European government debt in an effort to boost its returns as it faces a pension shortfall due to its aging population. The dollar dropped against the Euro to $1.5832 after ECB president Jean-Claude Trichet told the EU parliament yesterday that “rate cuts would only have encouraged risk taking”, and that he will remain “vigilant”. The ECB rate is 4%; “vigilant” has been known to be a code word for a rate increase. Prudent Bear Tice asserts that one of the factors needed to turn him into a bull on the U.S. economy is a “massive adjustment away from consumption towards saving and investment”. The only way to grow savings is to raise interest rates to control inflation so that money saved has actual value. A decent rate of return would also encourage investing in more conservative financial instruments, such as FDIC-insured certificates of deposit. Unfortunately, government and Federal Reserve policies act as a deterrence to saving. South Korea is not the only country facing the issue of a growing elderly population. The world has the greatest number of elderly people ever. Capricorn rules the elderly. Pluto in this sign until 2024 means that hard choices will need to be made, probably along with higher taxes, to make up for the years of out of control consumption that has left too many people and nations with a mountain of debt. Indeed, the need for the world’s population to increase their savings is more imperative than ever before.